Ultimate Antipodism is a massive book of 93 pages, 1 page front cover, 1 page editorial/ToC, 1 page SRD, leaving us with a whopping 90 pages, so let’s take a look! First: What is this book? Well, one could assume this to be the unofficial fourth part of Strange Magic, seeing how this basically represents a massive, non-vancian casting system and classes based on it. 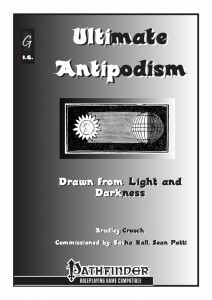 Antipodism is all about light and darkness and the things in-between – instead of the linear progression that characterized shadow magic in 3.X, antipodism is more about combos and the oscillation between light and dark. The concept was pioneered in the edgewalker rogue/assassin/shadowdancer-y class, then expanded to a full caster via the antipodist…and then, Interjection Games patreon happened and made Bradley write a huge expansion plus a third base class…and here we are, Ultimate Antipodism, courtesy of patrons Sasha Hall and Sean Paetti. I will structure this review by base-class and chapter. All right, so let’s get this party started! We begin with the antipodist: The antipodist base class receives d6 HD,1/2 BAB-progression, no good saves and a locus-progression of level 1 to level 4 and 2+Int skills per level. Antipodists are proficient with simple weapons, but not any armor or shields – no here’s an interesting cincher – they double the point costs of their loci when wearing armor they’re not proficient in, but are otherwise not hindered by them – meaning that you’re only a feat away from armored casting with these guys – sans penalties. The Antipodist receives two pools – a radiance pool equal to class level + Wis-mod and a shadow pool equal to class level + Int mod. These replenish after 8 hours of consecutive rest. Now an antipodist’s career is called “Journey through Light and Shadow” for a good reason – the antipodist learns so-called loci, which range from passive extraordinary abilities to supernatural and spell-like tricks. Loci are broken into three subtypes – light, twilight and dark. Within these subtypes, there are different philosophies further providing variation/sub-subtypes if you will. Now antipodists surprisingly have no caster level per se, but for interaction purposes, they treat their philosopher level as caster level. Additionally, though some of the antipodist’s loci are treated as spell-like abilities, they do NOT count as spells for e.g. PrC, feat-qualification and similar purposes. Catching this one and covering it properly is rather impressive. For the purpose of concentration, a locus is treated as locus level + 1/4 antipodist class level, rounded down. It should be noted that supernatural and extraordinary loci cannot be identified via Spellcraft. In order to activate a locus, the antipodist requires a key attribute (Wis or Int) of 10 + 2x level of the locus and save DCs, if required, are 10 + 1/2 philosopher level + key attribute modifier. It should be noted that antipodism utilizes the aforementioned term “philosopher level” to denote caster levels in antipodism-related classes in a streamlined, concise terminology. An antipodist begins the game with 3 loci and she receives +1 locus every class level. However, within each philosophy, an antipodist can never know more loci of a higher level than of a lower one – in order to e.g. learn a second locus of the 3rd level of a philosophy, the antipodist needs to know at least 2 loci of the second level of the philosophy – essentially a pyramid rule. The antipodist may replace a locus with a new one at 6th level and every 3 levels thereafter, but must maintain the level of the retrained locus – but NOT the philosophy, allowing you to “cheat” the pyramid rule to some extent. Some loci require the use of the antipodist’s shadow and thus, only one of them can be in effect for a certain time. At 2nd, 7th and every 6 levels thereafter, the antipodist may also choose one 1st level locus to become “well-travelled”, reducing the cost of said locus to 0, but at the cost of treating a level-dependent effect as half the actual philosopher level, with the exception of DCs and saving throws. At 11th level, the antipodist may 1/day cause a 3rd level or lower locus to be spontaneously treated as well-travelled, +1/day for every 3 levels. Finally, at 20th level, three different capstones loom, depending on the philosophy chosen – these include turning one 4th level dark locus into a light-locus (and vice versa) or a third pool, the twilight pool, which can exclusively be used to pay for loci of the twilight philosophy. Got that? Well, that’s not all – the antipodist can have different philosophical leanings – radiance, shadow or twilight. Twilight maintains the duality between light and darkness, whereas light and shadow, whereas the specialists in either light or darkness may not be able to utilize the other’s tricks, but instead receive a slightly (+2) increased pool and, more importantly, may choose to ignore aforementioned pyramid rule to compensate their decreased versatility – anyways, all choices further modify what an antipodist receives bonus-wise – which is nice. At 3rd level and every 3 levels thereafter, the philosophical leaning also provides further bonuses – increased pool size and minor bonus to one of the three saves. It should also be noted, that extensive advice for the DM and player to handle the transition of philosophies are provided – and that both light and dark are not tied to an alignment – playing CE radiance specialists or LG shadow specialists is very much possible. Now interesting in this seeming dichotomy would be the “drawn from experience” ability gained at 4th level and every 4 levels thereafter, choosing a philosophy and increasing its potency – the trick here being that the very progression of the class can be used to mirror the moral development of the character and the preferences chosen. Now a total of 4 philosophies for radiance and shadow are provided and additionally, there is the twilight philosophy, which counts as either. Got that? All right, so I’ll give you a brief run-down of the philosophies (If I mention every locus, the review would bloat…): Anima allows you to animate your shadow to execute close range reposition maneuvers, have your shadow record a locus (and execute it at your command) or stretch and peek around corners or even invade a target, potentially slaying it via fear. Other tricks of anima allow you to animate other’s shadows, commanding them to help or hinder target creatures and passive bonuses to AC when not utilizing your shadow actively can also be found herein. Bull rushing targets via swats of your shadow is also neat. The Beacon philosophy can help you cancel out ongoing fear-effects. on yourself and allies and perfect, short-burst flight alongside buff/debuff-effects, fast healing and healing (the latter with a 2 round delay-mechanism – interesting!) as well as beneficial mood lighting. Reflexive damage + dazzle when targets of a locus are hit by attacks and eliminating diseases and poisons also make for interesting choices. There also is e.g. an option to use your shadow to grant DR that scales with your level and e.g. mass, light-based flight. Now the coruscation locus is more combat-centric – duplicating color spray, unleashing deadly blasts of atomizing light and blinding light make for interesting choices. On a design paradigm level interesting, one locus allows you to regain limited radiance points of spent loci when reducing foes below 0 hp, meaning that the ability can’t be cheesed or kitten’d via well-travelled loci – nice way of preventing abuse there. Dazzling and blinding of foes are often accompanying effects of this, and the negation of concealment as well as causing “catching fire” (akin to alchemist’s fire) with coruscation loci can mean a nasty drain on an enemy’s action economy. We can also find a locus that enhances the damage rolled via coruscation, treating all 1s as 2s – Interesting. The illumination locus allows you to e.g. charge and increase the damage-output of the next damage-dealing locus you cast, net yourself darkvision, infuse texts with appropriate bonuses to skills or even “store” a d20 roll and later substitute it. Among the more interesting options, crits granting temporary radiance points are interesting…and since they only pertain the loci, no way to kitten this one. The Manipulator philosophy has some truly unique options as well – take for example the possibility of subverting and hijacking summoning spells – damn cool! Subverting enemy morale also makes for a cool idea – as does intensifying conditions – making the relatively useless dazzle-condition blinded instead, upping entangled to staggered – really cool, especially since the save varies on the condition intensified! Also rather unique – clouding the minds of foes, causing them to treat all targets as if subject to concealment. Ignoring the immunity of mind-affecting effects at the cost of shadow points also makes for a cool idea, somewhat analogue to DSP’s dread class. Also rather nasty – one high-level locus that is the equivalent of mass-haste for allies and mass-slow for adversaries. Causing the shaken-condition via images of “spiders, mothers-in-law” and similar horrific images made me chuckle and manipulating weapon-hands is interesting – a word of warning, though – if a target’s HD exceed those of the antipodist, they may instead receive a buff! Now while this may look like an strange design decision, it also opens an uncommon way of using the class – cohorts and similar followers may actually end up as buff-specialists for their masters, with minor manipulation thrown in the mix. Oh, and yes, you can make foes attack themselves en masse. Now the Obscurity philosophy, of course, is the go-to toolbox of stealth-focused tricks – from turning into smoke and instantly moving 5 ft. per class level (to e.g. escape from the guts of a huge creature that has swallowed you whole), entangling globs of greasy darkness, dual short-term reflexive shaken/blindness – so far, so good. What about beginning an insurrection of shadows, resulting in a target receiving additional weapon damage when hit by a target for the first time in a given round? This philosophy has also perhaps one of the most powerful passive abilities of the whole class – once per day, your shadow dies instead of you when first reduced by something that required an attack roll reduces you below 0 hp. (Of course, the shadow regenerates, rendering this a neat type of life-insurance, though your shadow’s absence may severely limit some of your options…) Shadow evasion and granting a weak sneak attack can be considered rather cool options as well, rendering this philosophy probably one of the go-to choices for thieves and those versed in the lore of the underworld – tag-teaming with your shadow to ignore the movement-penalty of difficult terrain does make for cool imagery. Evasion when unarmored is surely appreciated. The Refraction philosophy allows for 1st level invisibility via bend light, with the added caveat that taken items (up to 10 ft. sticking away from your body) also become invisible. Now while the mechanics of parabolic dishes may not be particularly elegant (not a fan of opposed rolls in PFRPG), it works mathematically here – d20+BAB+Wis-mod+deflection bonus to AC (e.g. granted from the hovering parabolic dish) against incoming rays – if you win, you can catch and return the ray to its sender, destroying the dish. Generally, this one can be thought as the most defense-focused of the philosophies, with quite an array of e.g. AC-bonus netting and even mirror image-like loci. An abuse-safe retribution-spear can also be found among the loci here. What about a locus granting charges that grant resistance bonuses to saves and can be spent in place of your shadow? The Umbral Embrace philosophy is probably the most sinister of the respective philosophies – a lot of the loci impose negative levels and e.g. darkness rising even further penalizes saves against the ability depending on the amount of negative levels accumulated. One of the more iconic loci would e.g. allow you to conjure forth the literal sandman to put your foes to sleep and another generates an anti-duplicate of the target that crashes into it for massive damage. What about a nice combo-set-up that adds negative levels to foes when you continue to pile on umbral embrace loci? The Twilight philosophy is rather peculiar in its general versatility, allowing you to increase the potency of loci when alternating between light and dark loci. Increasing the point cost of loci in order to have them apply to additional targets also makes for versatile options and adding swift action dimension doors to the casting of 4th level loci also offers some unique tactical tricks. A sneaking, auto-flanking weapon of shadow, a bolt that can be modified as belonging to any type of philosophy – the twilight philosophy is probably the most versatile and diverse of the philosophies. All in all, a total of more than 170 loci (that’s a SIGNIFICANT upgrade over the first iteration!) make sure that antipodists will have A LOT of combo-potential and tricks at their beck and call. The class also comes with favored class options for the core-races plus drow, aasimar, tiefling, kobold, orc, hobgoblin and puddling. Furthermore, we get antipodist archetypes, the first of which would be the extremist. In the extremist, light and darkness wage war and thus, the archetype gets a duality pool. This pool’s size cannot exceed 5 and begins play empty. Whenever the extremist activates a non-well-traveled locus and the pool is empty, she gains 1 duality point and the pool is “charged” or flagged in opposition to the locus activated: Activation via light flags it as dark and vice-versa. Each time, the extremist activates a locus whose descriptor does not match that of the pool, she gains 1 point. As soon as she activates one that matches the pool’s descriptor, it empties and provides benefits according to a handy table – from one-round-rendering a locus well-traveled to reduced costs, careful planning can provide some neat combo-potential with this pool added. Philosophical leaning-wise, extremists get +1 locus (+1 at 5th level and every 5 levels thereafter), but may never learn any loci from twilight. The Drawn from Experience ability of the base antipodist is also heavily modified, precluding e.g. the taking of a given benefit more than oonce, but at the same time having a scaling upgrade at 11th level. As a capstone, the extremist gets ANOTHER pool, the EXTREME (cue in 90s music) pool – 10 points that can be used to escalate the benefits granted by her duality pool when activating its benefits. Some people may complain about the pools to manage. I’m not some people. I like the extremist and how it plays. It’s a unique, nice archetype. The second archetype, the Specialist Philosopher, is just what you’d expect in such a context – a specialist of one of the philosophies: They choose a favored philosophy and begin play with +1 locus from this philosophy, gaining an additional one at 5th level and every 5 levels thereafter. When learning loci from this philosophy, the specialists can ignore the pyramid rule. The specialization has full compatibility with the philosophical leaning class feature, though changing it from the prescribed specialization means that the character loses the access of the 11th level class feature. 11th level nets a well-traveled 2nd level locus from the favored philosophy, +1 at 17th level, instead of wayfinder. Drawn from experience is also modified. The capstone nets the specialist a specialist pool equal to 4+ number of 4th level loci known in the favored philosophy – these points emulate the points required by the respective favored philosophy. In a minor nitpick – the text calls the specialist philosopher “extremist” here. The edgeblade would be the new class herein – it gets full BAB-progression, good Will-saves, d10, 2+Int skills per level, proficiency with simple and martial weapons, light armor, medium armor, shields. The penalty for non-proficient armor is to increase the cost of waypoints by +1. The edgeblade gets class level +Wis-mod shadow pool and class level + Int-mod radiance pool, minimum 1. This does not look like much, right? Well, the edgeblade also gets residuum pools – a light residuum pool and a dark residuum pool. Whenever the edgeblade uses a non-finisher light waypoint that costs at least 1 radiance point, he gains 1 light residuum; the same holds true for dark residuum and dark waypoints. These pools can hold a maximum of 2+1 per 6 edgeblade levels each. Residuum is used to fuel residuum powers and waypoint finishers. They also have a stability score, which begins at 1: Any minute the edgeblade does not gain or spend residuum decreases the residuum score in the pool until the pools reach the stability score. residuum does not replenish – it empties upon resting and needs to be filled again each day. The stability-score is interesting in that it represents a crucial balancing mechanism and some really intriguing untapped potential to play with in further designs – tying it to waypoints, abilities and the like does sound like something I’d sooner or later try to craft myself. At 1st level, edgeblades get 3 residuum abilities: One light, one dark, one twilight. 2nd level, 3rd level, 4th level, 7th level and every 4 levels thereafter, the edgeblade gains +1 residuum ability. These abilities need to be prepared – each day upon resting, the edgeblade chooses one light, one dark and one twilight ability, which then are considered to be prepared. Residuum abilities can be considered the unique passive buffs – resistance against all elemental energy types + sonic equal to residuum or twice residuum, decreased armor check penalty, adding mighty cleaving at higher level to the weapon, better initiative, saves, hurling minor fire-damage causing balls of flame, reflexive dazzle or generating the other type of residuum when one pool is full, these abilities provide a baseline of unique options to supplement the fighting styles of the edgeblades. 1st level nets the edgeblade gets two waypoints, +1 at 2nd level and every two levels thereafter. If applicable, the DC for such abilities is 10 +1/2 philosopher level (=class level)+key attribute modifier (Int or Wis, respectively). As always, waypoints marked by an asterisk utilize the shadow of the respective edgeblade – only one such effect can be in place at a given time. You’ll notice something: Edgeblades are crazy MAD – as such, at 3rd level and every 5 levels thereafter, they get +1 to Int and Wis for the purpose of waypoint DC, stacking with itself, up to a maximum of the highest physical ability score. At 4th level and every 5 levels thereafter, an edgeblade gets +2 to his pool-sizes, to be freely distributed among radiance and shadow. 5th level and every 4 levels thereafter provide a antipode or combat bonus feat. 5th level and every 5 levels thereafter provide a greater waypoint for the edgeblade. 6th level edgeblade may perform a finisher that requires a standard action in place of the first attack of a full-attack action or in place of the first attack while charging or instead of a charge. The wording here is slightly wonky, but still precise enough – still, I’d be interested to know whether the benefits of the charge still apply to the finisher combined with it. As a capstone, the edgeblade may prepare a 4th residuum ability. We get favored class options for the usual array of races in IG-supplements: Core, orc, hobgoblin, tiefling, drow aasimar, kobold, puddling. Archetype-wise, the first would be the Dawnblade, who only gets a radiance pool equal to 2xdamblade level +Wis mod. Unlike the regular edgeblade, the dawnblade has no stability-score to contend with – his residuum does not decay/dissipate – which also precludes the archetype from qualifying for feats and abilities that modify residuum stability. The dawnblade begins with 2 residuum abilities, +1 at 3rd level and every 4 levels thereafter. Residuum abilities have to be prepared and the dawnblade may prepare two – both of which obviously must be light residuum abilities, since the archetype cannot choose dark or twilight. However, the dawnblade receives some unique residuum tricks – like a blade of light (cue in all the Star Wars jokes and quotes you know…I’ll be waiting…all right, all done?) that scales its potency at higher levels, no-save dazzle, reduced finisher costs and temporary radiance points when spending 3+ light residuum. The archetype gets 2 waypoints at 1st level, +1 at 2nd level +1 every two dawnblade level. The entry here is a bit redundant, since it mentions dark waypoint DCs, even though the archetype can’t use these. 4th level increases radiance pool by +1, a further +1 every 5 levels thereafter. The 6th level ability is modified by reducing the cost of the first finisher in the first round of combat by -1 t a minimum of 1. This does not allow for the execution of finishers beyond the maximum residuum capacity of the edgeblade. Where there is Dawn, there is Dusk – and hence, there also is a dark-specialist. Analogue to the dawnblade, the duskblade receives only a shadow pool of 2 x class level + Int mod. Conversely, the duskblade does not get light residuum. Now this would not be Interjection Games, if we just got a mirror image, right? Instead, we get a pretty cool mechanic based on the symbolic phases of the moon: When the duskblade prepares residuum abilities, he assigns one ability to the new moon phase and one to the full moon phase. The beginning phase each day is “new” – during combat, there is a cumulative 20% chance to change to the next phase. Phase-change eliminates 1 point of dark residuum and resets the chance to 0%, but also gets +2 atk, saving throws and skill checks for one round. The interesting thing here is that the archetype thus gets an unreliable, slightly chaotic flow, but one that allows for the simultaneous activity of two residuum abilities at once when the phase is waning/waxing…oh, and new/full also have additional benefits that play with the residuum mechanic – and they’re beautiful. Seriously, love this mechanic! Akin to the dawnblade, the duskblade does get some exclusive residuum abilities, including nonlethal cold damage and immediate action-residuum-powered reflexive invisibility at higher levels. Like the dawnblade, the waypoint section, somewhat confusingly, notes the information for light waypoints, when the duskblade can’t take them. The other components of the chassis are similar to that of the dawnblade, so to avoid redundancy, I’ll skip ahead. The waypoints provided are grouped by type and by minimum level – 8th philosopher level is the maximum such abilities require, with greater waypoints at most requiring 15th level – from globe of invulnerability-type immunities to other tricks – now the intriguing idea here is, obviously, that the terminology of finishers allows for the combination of waypoint-mechanics between edgewalker and edgeblade, while still maintaining the unique identity of the edgeblade. Between Loci, finishers and the like, this means there is still a lot of untapped potential within the systems presented here that could be expanded in future supplements. The edgewalker gets 4+Int skills per level, d8, proficiency with simple weapons, short sword, rapier, sap, kukri, shortbow and whip as well as light armors and shields. Over the 20 levels of the class it receives a sneak attack progression from +1d6 to a maximum of +7d6 at 19th level and the class gets a 3/4 BAB-progression and good ref- and will-saves. The edgewalker has also been codified according to the philosopher level terminology and has full philosopher-level progression. As you can imagine, Uncanny Dodge also can be found among the class features, at 3rd level. Now as a Batman/stealth type of class, receiving evasion relatively soon should not be considered uncommon (2nd level, improved evasion at 11th level, nerfing these two and taking away any lingering sense of these components being problematic) and 6th level edgewalkers receive hide in plain sight as long as they are within 10 feet of a sufficiently large shadow. Now this still makes targeting the edgewalker with spells et al rather difficult – the class is geared rather well towards taking softer targets out. Beyond FCOs for core races, drow, aasimar, tieflings, hobgoblins, kobolds, orcs and puddlings (all solid) and it’s the time I should explain the core talent system of the class: Essentially, edgewalkers start the game with two so-called waypoints known, one light, one darkness and at 2nd level and every 2 levels thereafter, the class receives an additional waypoint. Now there is a cool restriction in place here – the edgewalker needs to keep a balance between light and darkness, which translates to waypoint selection: If your light-based waypoints exceed those that are darkness-based, you need to learn a darkness-based one next and vice versa, creating a kind of equilibrium. It should also be noted that a couple of these waypoints count as either light, darkness or twilight. Now before I get towards waypoints, you should also be aware that at 5th level and every 5 levels thereafter, the edgewalker also receives a greater waypoint, which can be considered a kind of more powerful talent – one that requires some planning, for the greater waypoints also have to adhere to the light/darkness-dichotomy, offering opportunities for proper planning of character progression. The capstone of the class allows you to use radiance and darkness pool interchangeably – a slight increase in power when compared to the original iteration of the class, but one I welcome. Archetype-wise, we receive the motebringer (previously released on its own). The motebringer has the same basic class-chassis regarding saves and BAB as the edgewalker – unlike the edgewalker, who oscillates between light and darkness, the motebringer is a specialist of utilizing light – as such, the archetype only receives a radiance pool equal to class levels x2 + Wis-mod – but no shadow pool. Seeing how this means that several of the combo-set-ups that render the edgewalker captivating to play fall away, we thus receive a significant array of infusions, the first of which is gained at second level, +1 at 3rd level and every 2 levels of motebringer thereafter. The second archetype provided herein is no less complex than the motebringer – the shadowfriend. The shadowfriend loses sneak attack and instead begins play with a shadowy remnant of what he once was in an alternate reality – unlike companions and the like, the motivations of these guys sync automatically up with yours. If the shadowself is destroyed, it can be regained in a rite costing 200 gp x level. The shadowself has 1/2 HD (min 1), 1/2 BAB-progression, halved bad-saves, gets up to 20 skills (2 at first level, +2 at third and every odd level thereafter) and begins play with one feat, +1 at 5th level and every 4 levels thereafter. The shadow also gets sneak attack that scales up to +6d6. Healing via waypoints may spontaneously be redirected towards the shadowself and waypoints with a range of personal may also affect either. The shadow can always spider climb and occupy the same square as the master. Taking away its surface lets it snap back to the master’s feet and even teleportation is properly handled for the shadow. The shadow self is immune versus precision damage and crits and all its attacks are touch attacks. When removed from the master by more than 30 ft or out of line of sight, the shadowself curls up in an inactive ball and is helpless, dissipating after 1 hour of inactivity. Masters and shadow can freely communicate verbally, but other creatures do not understand this communication – which is a bit odd: Why not make this a telepathic link? I don’t really get how that works. The master uses a language, right? Anyways, at 2nd level, the shadowself gets DR 1/- (+1 every 4 levels) and uses Int-mod to calculate hp, Fort-saves and Con-based special abilities. At 5th level, shadowself duplicates the master’s weapon or shields as masterwork versions, with 8th level allowing for a +1 enhancement bonus that scales up by +1 every 4 master levels thereafter. 5th level provides improved evasion. Shadowselves have Str, Dex, Wis, Cha and Int 10 and no Con on account of being a construct, which also means d10 HD. The shadowfriend does pay for this powerful pet with pools – they only get a shadow pool equal to 2xclass level+Int-mod, minimum 1. No radiance tricks and neither may they learn radiance waypoints. 3rd level nets the shadowfriend and his shadowself a shadow of their own for the purpose of waypoint/locus-activation and 5th level and every 6 thereafter increase the shadow pool point size by +2. The shadowfriend is an extremely cool archetype and imho mops the floor with the motebringer – touch attack sneaks are nasty, in spite of the bad BAB and while the shadowself is fragile, it can be used in pretty awesome ways. That and the ability’ codification is a thing of crunchy beauty. All right, I’ve stalled long enough – let’s talk about the waypoints that constitute the primary resource of unique, active tricks of the edgeblade and edgewalker. Now you’re of course interested in the aforementioned waypoints and the waypoints themselves have diverse prerequisites – from none, to level-caps and other waypoints have certain skills and feats as prerequisites, which thankfully are listed in the handy lists provided for the respective classes. Now what can you for example make with these waypoints? Well, since there are more than 100 in here (approximately double of what we had before! ), I’m just going to note that the following is not a comprehensive list, but rather an array of options that should be considered kind of representational for the classes. While many waypoints are available for both classes, of course there are some that are exclusive for either. As a special mention: Yes, the theme of character-development and specialists seem contradictory, but the pdf does provide guidance for archetype-switching, so that should also be noted…just in case you notice on of the numerous combos herein too late and/or have a change in your character’s development. There is another component I should mention: Finishers tend to allow for escalation – i.e. the payment of additional residuum to increase the potency of waypoints. Waypoints also thankfully generally provide scaling benefits, but I guess, at this point, that’s a given. Very interesting for blocking charges and the like, “A Thousand Grasping Tendrils” allows you to, as a swift action, reshape your shadow into an array of tendrils that create a micro-aura of 10 feet of difficult terrain around you – which, of course, does not hinder you in any way. Ignoring difficult terrain and effortlessly scaling any incline less than 90° can also be done by these fellows. Another waypoint offers a dazzle against a creature you threaten – sans save, as an immediate action, useable whenever you switch between light and darkness consecutively. Armors of light (that do not necessarily enhance your stealth…), a shaken-causing breath weapon of black wind, 1 round slow at a higher save DC, better stealth, cushioning falls (the longer the fall, the higher the cost), very minor reflexive damage (plus dazzle), creating areas of demoralizing gloom and putting creatures subjected to fatigue-related negative conditions or con-damage/drain to sleep is rather interesting. Why? because for the edgewalker, rolling bad on sneak attack is not necessarily a bad thing: For each natural 1,2 or 3 rolled on such a roll, you also deal one point of Con damage if you take the right 8th level dark waypoint. What about edgeblade clothing themselves in DR-granting armor of hardened light, with options for escalation? Now where things get interesting would e.g. be with the exceedingly cool ability that lets you set up your shadow as a flanking supplement and, quite possibly for the first time since I’ve been doing this reviewing thing, gets such an ability actually right. Now, with Ichor of the Firefly, the edgewalker may coat his/her weapons with virulent light that invades the bodies of target, negating invisibility etc., while also providing significant bonus damage, especially against creatures sensitive to light. Making conversely, a poison from darkness itself that scales damage-wise over the levels also becomes a distinct possibility. Speaking of said poison – if you use the dark-aligned poison, you may add a neat combo (though the following is not restricted to the darkness-based poison) that allows you to ignite the poison coursing through your foe’s veins, dealing significant fire damage. Damn cool! The equivalent of solo tactics sans requiring an ally (but only while your shadow isn’t otherwise occupied) also makes for a cool array of tactical options. Want to know what’s lurking round the corner, in the adjacent room etc.? What about stretching your shadow up to 60 feet and looking through its eyes? This ability, which can be taken at first level, is narrative gold and iconic in imagery! Of course, various spell-like abilities, poison use, pillars of light that heal minor damage, motes of searing light or making your shadow the equivalent of a kind of bear trap are possible, but for me, the anti-ray/attack-roll spell Tenebrous Tango, which allows you to have spells utterly miss you – think mirror image variant with an edge. At a permanent cost of 1 point from a pool of your choosing, you may also master poisons to the extent they become more potent, making your poisons at +1 DC more lethal – and with quite a few requiring consecutive saves in PFRPG, this makes sense. Now I did mention those greater waypoints and as you may have imagined, they are the big ones – Summoning forth several shadows from you one – cool. But more interesting would, at least for me, be the game-changer that is Cumulative Exposure – it deals automatic damage to all adjacent creatures whenever you subsequently use two waypoints. Using multiple dark waypoints may also yield bonuses and igniting mundane light sources to emit blinding flashes makes for a cool idea and better light/darkness poison/ichors are lethal and cool – what about e.g. an ichor that makes the target suffer from miss chances galore, but also receive an applicable miss chance as it becomes insubstantial -nice reflection of the duality-theme in the crunch here. Now also rather awesome would be the option to steal other creature’s shadows via ranged CMB to power darkness-waypoints. Cool here – the ability manages to properly prevent kitten-bag abuse. Lifelinks also are possible – ouch! Now it should be noted that, although the page-count of the pdf remains unchanged, quite a few stock artworks have been taken out of the file to make room for more waypoints, which is rather cool and adds to the arsenal of an already fun and inspired class. It should be specifically noted that the greater waypoints receiving some awesome tricks – what about establishing a link that damages a target when you are healed? Yeah, evil and oh so cool! If all of these options still are not enough – yes, there are feats to enhance the classes here, but this review is already 12 pages long as is – so let’s jump to the conclusion. Editing and formatting are very good – there are almost no issues in here, most being typo-level and in the exceedingly rare case some piece of mechanic is influenced, it is to a small degree that still allows you to deduce what’s intended. The pdf sports thematically-fitting stock art and layout adheres to Interjection Games’ elegant 2-column b/w-standard. This book has one massive issue on the formal side – no bookmarks. Beyond making this review relatively painful with a lot of scrolling, this means that printing out this massive book is something you should do – a book of this size, sans bookmarks, is very user unfriendly. I asked what happened and it turns out, there are supposed to be bookmarks – but the technical side of things has screwed the pdf, thus breaking them. It would basically be required to build the whole book anew to make them work. And ultimately, that’s my one issue with this book. You already know I loved the respective three classes, with particularly the edgeblade being just fun to play. All archetypes herein are unique, sporting a significantly-changed playing experience from their unmodified classes – to the extent where the archetypes can be considered more unique than some variant classes out there. Bradley Crouch delivers a highly complex and rewarding casting system here, one that codifies antipodism and makes it feel more concise. Unlike previous systems, antipodism is all about the combos: Much like the themes it represents, you’ll have better DPR-options with other systems. What makes this book’s classes awesome is their deliberate emphasis on cool combos and synergy effects – if you enjoy classes that play intelligently, then this book provides content galore, with the vast majority being quite frankly unique and not something you’d see in the arsenal of other classes. Juggling highly complex concepts and getting the wording right also constitutes one of the unique benefits here. Content-wise, this is awesome and if you’re willing to print this out, it’s definitely worth the investment of the fair asking price. That being said, the lack of bookmarks really, really hurts this massive, otherwise great book. Let’s make this abundantly clear – this would be 5 stars + seal, in spite of the few minor glitches here and there and to me as a private person, it is just that….But, as a reviewer, no bookmarks constitute a big fat issue for a book of this size. If you don’t have a problem with printing this out, then get it – for you, the above verdict very much holds true. However, as a reviewer, I can’t just assume that and have to rate the pdf as is; as much as it galls me, I have to detract 1 star, ending with a final verdict of 4 stars – if you print this out, I’m pretty sure you will love it, though! You can get this massive, unique system here on OBS and here on d20pfsrd.com’s shop! Want Bradley to make unique classes/supplements according to your specifications? You can do just that here on the Interjection Games patreon! 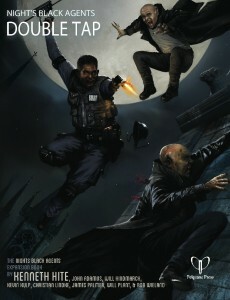 This massive expansion book for Night’s Black Agents clocks in at 134 pages, 1 page front cover, 1 page inside of front cover, 2 pages of editorial, 3 pages of ToC, leaving us with 123 pages of content, so let’s take a look! This review was moved up forward in my reviewing queue due to me receiving a print copy in exchange for an honest and critical review. All right, so, if you recall my original review of Night’s black Agents, you’ll recall that I have received said book as a gift from a friend of mine and how much I loved it – however, there always remained one particular observation that may be considered somewhat problematic: Night’s black Agents is based on the GUMSHOE engine, which is perhaps the best investigative RPG-engine out there. At the same time, though, Night’s Back Agent’s different gameplay styles at least partially implied a higher degree of emphasis on action and high-octane gameplay than what you’d see in Trail of Cthulhu or Esoterrorists. Night’s Black Agents managed to partially offset the engine not being per se designed for this type of gameplay via the introduction of a significant amount of thoroughly inspired tweaks to the system. Well, if you’re like me and have played a couple of Night’s Black Agents-scenarios, you’ll immediately notice what this book is: It’s the high-octane Advanced Player’s Guide, the 13 True Ways, of Night’s Black Agents. Let me elaborate: The book is divided into two sections, one for players and one for directors, with the player-section beginning with abilities – here, we are introduced to ability focuses like money laundering that concisely define what can be done with them; better yet, the respective entries do sport a plethora of techniques associated with the respective ability focus – in the above example, we’d for example receive information on overseas accounts, shell companies and the like. The abilities also sport tactical fact finding benefits that list sample possible spends and clues, the latter of which sport the handy glyphs denoting the nature of vampires in your given campaign. Beyond offering benefits for the players, this excessive section also provides a significant amount of unique hooks that directors can utilize to weave into their respective campaigns – from astrophysics to handling radioactive material to gladhandling via Cryptography, this chapter provides an immensely enriching array of options not only for investigative abilities, but also for the various general abilities featured. Indeed, beyond significantly enriching the rich tapestry of options at the beck and call of the agents, the supplemental rules also improve the versatility and variety of action-scenarios available. Oh, and if you’re annoyed by absolute super-pro secret agents failing certain tests, then you may want to check out the optional mastery rules provided. That being said – yes, this chapter also covers an impressive array of new cherries for your agents, further diversifying the abilities and improving the reward ratio for specialization beyond what the core-book offered -from retro-active pickpocketing to nigh-undefusable bomb-set-ups, this chapter is a true beauty and further cements Night’s Black Agents as the mechanically most refined GUMSHOE game out there. Beyond combat-centric cherries and a general expansion of abilities, one should not fail to mention the tricks of the trade – usually requiring 8+ in the respective ability, these allow for superb cheating skills via a 3-point spend, improvising alibis, mad hacking skills (played via hilarious techno-babble) or even James Bond/Knightrider-esque signature vehicles. And yes, this extends to a set of unique and inspired new thriller combat maneuvers, including being thrown away by the blast – riding the shockwave, if you will. On a personal note, that had me chuckle quite a bit since it’s been a running joke in my games ever since I once managed to evade a lethal 20T-explosion in Shadowrun and come out of it unscathed thanks to a ridiculous amount of luck. Now one basic issue regarding espionage tradecraft ultimately remains the problem of what can be done with which ability – here, adaptive tradecraft helps, suggesting a rather impressive amount of uses for the respective abilities in uncommon ways – from monitoring a negotiation to manipulating webcams, this section, once again, is all about the glorious options that should be at the fingertips of elite spies. If your players are like mine, they will have, not only in-game, immensely benefited from the standard operation procedures and thus quickened the general pace with which you can handle complex operations, investigations and plans – well, there’s more here: The Carthagena rules should further help agents operate within the challenging requirements of destroying a global vampire conspiracy. Obviously, an agent is only as good as his tools – we did learn that from Mr. Bond et al., right? Hence, new materiel is introduced – by the buckets: Voice synthesizers, scramblers, facial masking, RFID sniffers and even low-powered wrist lasers can be found here. And yes, the optional rules here also cover the effects of EMP-weaponry, should you wish to go that route! Oh, for high-octane games, I should also mention jetpacks, while dust-games in particular will appreciate e.g. winches or magnetic licensing plates. And yes, if you’re particularly prepared, you can benefit from the Q-rule and have utterly awesome, strange gadgets at your disposal – at the hefty price of a 12-point preparedness spend… Obviously, this level of detail also extends to weaponry, which is not only listed by special OPs forces that employ them, but which now benefits from new uses and cherries as well. Thriller contest rules have been a crucial part of Night’s Black Agent’s appeal for a more action-driven gameplay style and indeed, the rules receive some utterly non-optional expansions: Beyond digital intrusion, infiltration, surveillance and manhunts all receive extensive supplemental rules to make them more exciting – this chapter alone is so compelling, I’d never want to miss it in any of my NBA-games…and yes, even when playing different games, a GM can still learn quite a bit here. Where the player-section of this book was focused primarily on expanding the options and further streamlining the suspense-factor, the director’s companion chapter can be considered to be all about utility: Need some sample NPCs that don’t necessarily feature in the main-plot? The significant array of Cameo-stats for mechanics, superintendents and the like has you covered – and it hilariously includes a goth in love with the dread vampire predator. Nice, winking nod towards one of my subculture’s obsessions and how that would pan out in Night’s Black Agent’s world…. Beyond these people, ready-made establishing shots of various places, sporting enough details for compelling narratives, can be considered another godsend for the director whose agents have once again gone off script. The book ends with handy summaries of cherries, combat rules, vampire powers etc., all available in a very user-friendly manner, as well as with a massive and very useful index. Editing and formatting are excellent, I noticed not a single glitch. Layout adheres to Night’s Black Agent’s 3-column b/w-standard and the artwork utilized is original and generally, high-quality and evocative. The electronic version comes fully bookmarked with nested bookmarks for your convenience, while the softcover print version features high-quality, glossy paper and leaves nothing to be desired regarding the quality – and it better not, for this book will see A LOT of use. All right, if you’ve been following my reviews, you’ll have noted that I pretty much spoiled the review from the get-go: Mentioning this book in the same breath as the Advanced Player’s Guide and 13 True Ways should tell you something about it: Namely that this book is, what I’d call the “unique identity marker.” Don’t get me wrong, Night’s Black Agent’s core book is an absolutely excellent tome that deserves all the praise I heaped on it. At the same time, though, it is still very much obviously a GUMSHOE-book and as such, offers a playing experience that may deviate from Esoterrorists, Trail of Cthulhu, etc., but at the same time, there are parallels you can utilize. When adding “Double Tap” to the fray, the unique components of Night’s Black Agent’s are not only expanded, they are amplified – significantly. And best of all, for the better. For even in a game that blends multiple GUMSHOE-games, you can still make this the representation of the step up to hyper-pro mode. Basically, this book makes everything more exciting and versatile for the players and at the same time, it helps the directors out there manage what’s important with its extremely useful cameos and set-piece establishing shots. If the above accumulation of basically unfiltered praise was not ample clue for you: This may very well be the best GUMSHOE rules book I’ve read so far. It succeeds also absolutely perfectly at making Night’s Black Agents run more smoothly – the fast-paced infiltration rules, the nice nods regarding digital intrusion, the rules that run the gamut from realistic grit to high-octane action – all of these conspire to make this book a non-optional purchase for a GUMSHOE-system if there ever was one. I fact, if you liked the rules of Night’s Black Agents and scavenged them, I wholeheartedly encourage you to do the same here – Double Tap is chock-full with pure excellence. Kenneth Hite, John Adamus, Will Hindmarck, Kevin Kulp, Christian Lindke, James Palmer, Will Plant, Rob Wieland, Gareth Ryder-Hanrahan – gentlemen, you have created a truly astounding, must-have book that has to be considered non-optional for Night’s Black Agents and extremely rewarding for GUMSHOE beyond that. My final verdict will clock in at 5 stars + seal of approval. You can get this inspired, must-own expansion for Night’s black Agents here on OBS! This prequel for the unprecedented Crisis of the World-Eater-saga clocks in at 14 pages, 1 page front cover, 1 page editorial, 1 page advertisement,1 page SRD, 1 page back cover, leaving us with 9 pages of content, so let’s take a look! All across the world, an uncanny psychic scream echoes through the minds of the minds of the world, driving many individuals to suicide – and the trail leads to the irradiated Kray Wasteland, officially a hostile area broken by the impact of a meteorite. Major Marco Dempompa send the PCs into this wasteland – and it is here, the PCs find something they did not expect: Beyond the deadly gangs that inhabit the wasteland, the PCs unearth a strange, star-shaped complex – for from it, the scream was sent forth. They are not alone in their discovery, though – it is here that a secret super-soldier program was launched and three of these changed beings now have returned: The apathy-field generating arcanist Synapse, the unbreakable Colossus like berserker Vault and the Magneto-style elven storm sorceress Ozone. 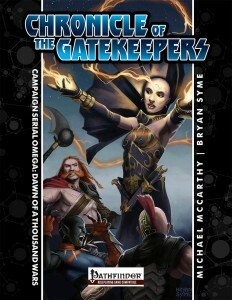 Finally, beyond the locked down central section, the deadly quicksilver/flash-like Black Silver and the cabalists of the Onyx Cabal remain – and here, the PCs find the broken figure depicted on the cover, the chronicler – who has regained his strength to emit the scream…to warn the world of the approach of Saitan, the deliverer of Omega…before falling back into hibernation. I should btw. mention that the bosses/super-soldiers of this module, like bosses in Metal Gear Solid or superheroes/villains sport unique abilities that render them significantly more interesting than the sum of their builds. Editing and formatting are very good, I noticed no significant glitches. Layout adheres to a printer-friendly, elegant 2-column full-color standard established in the surprisingly awesome “Chronicle of the Gatekeepers”-campaign serial, though with minor modification. The pdf’s artwork is original and absolutely stunning and the cartography is just as awesome. The pdf comes fully bookmarked for your convenience. 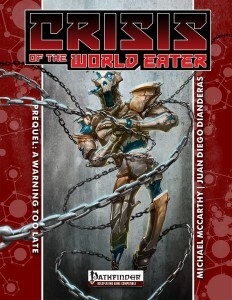 This brief module by Michael McCarthy, Jeff Lee and Louis Porter Jr. delivers in its promise – it makes me excited for “Crisis of the World-Eater” – even more so than I was before – the evocative backdrop suffused with exceedingly cool bosses renders this a great little module. Oh, and this one is “Pay What You Want” – which means there is literally no reason why you shouldn’t check out this cool little module. Personally, I do believe that it is worth a tip/compensation for the obvious care that went into it for the unique bosses alone. Seeing how this is PWYW, I can’t see a reason why this should not be considered to be 5 stars + seal of approval – an intriguing, first glimpse at the vast things to come. You can get this cool module for any price you want here on OBS! Coldwater is perched upon an inhospitable, mud-drenched coast, with one access by land, its harbor is in the delta of a miserably stream that empties its contents into the sea – and if that does not reflect a place you’d like to visit, then that’s pretty much a representation of how most folks see this place. Nearby caverns sport strange stair-like features that only rarely become visible and the inhabitants of the village are just as sullen and unfriendly as the weather suggests. Both village lore and statblock reflect the relative hostility and rugged nature of the village rather well, while a Finnish-inspired nomenclature emphasizes an association with the colder climes. Creighton Broadhurst has skill – and this one shows it pretty well. 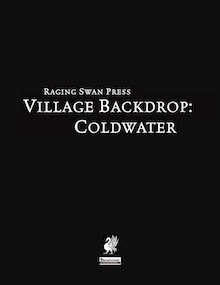 The mastermind of Raging Swan Press delivers what I’d like to call a wide open sandbox: We are faced with problems and the respective NPCs mentioned can be used to exacerbate it, change it…all depending on your whims. Basically, this is one of the village backdrops that is so compelling, it can make PCs pretty much write their own tale: Throw them in and watch what happens. In this aspect, though, this one is slightly inferior to Kennutcat. However, at the same time, it sports local color that made me think of the slight surreal elements that made Twin Peaks so compelling, at least for me -from the dwindling fortunes of one family to female, hard-working and drinking half-orc, there is a lot of quirkiness, a lot of unique bits and pieces here; enough, to make this thoroughly compelling and well worth 5 stars + seal of approval. 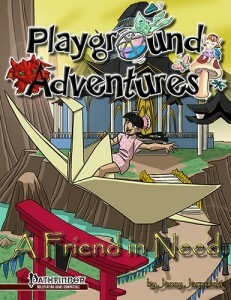 You can get this great village here on OBS and here on d20pfsrd.com’s shop! Okay, usually I don’t do kickstarter-recommendations for newcomer publishers that do not yet have an established track record. This would be the exception to the rule due to 2 factors. 1) I’ve seen the module’s current state and it has progressed to a pretty professional state; the fact that the crew sent its Pdf my way bespeaks their confidence and the nice layout and artworks, upon skimming through, make obvious that this confidence is not misplaced. 2) More importantly: They got none other than Rusted Iron Games’ great monster-craftsman Russ Brown AND, and that is a BIG deal for me, Richard “I write modules that are pure ART and am perhaps one of the most humble and awesome authors out there” Develyn from 4 Dollar Dungeons (you know, the guy who routinely makes my Top Ten-lists as if it were a cakewalk…) on board. With less than 500 Australian Dollars to funding and 6 days to go, I certainly hope they’ll be funded and take the advice provided. Seeing these factors, I’m rather confident, the module will turn out to be awesome! You can check out the KS here! “The Blight is a city; a vast corpulent, mad, ugly thing, but it is so much more than that. Its veins seep into other places, drawn across the Between, which rips at its fabric and tosses it about like a child throwing a ball. You might find a curiosity shop from the Blight crammed amongst the mighty tenements of some other city, a horrific character staggering along the streets of an otherwise normal town, or perhaps even a whole block perched within another city like a cuckoo in a nest. And if that sounds too Victorian for your tastes (though personally, I love quasi-victorian fantasy), then take a look at Matt Finch’s post here, where he explains the unique tone of this place. Yeah, that would be the next thing: With Matt Finch, Bill Webb, Greg Vaughan, Skeeter Greene and Chuck Wright, you know that some of the true masters are about to add their talent and expertise to this book as well. If you couldn’t tell – I’m incredibly hyped for this book! The KS has 52 days left and is well on track for funding, so do yourself a favor and check out this beast! 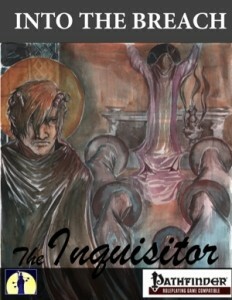 You can get this neat inquisitor-toolkit here on OBS and here on d20pfsrd.com’s shop! This installment of 13th Age Monthly clocks in at 13 pages, 1 page front cover, 1 page SRD/editorial, leaving us with 11 pages of content, so let’s take a look! 13 True Ways introduced summoning for two new classes – druid and necromancer, and now, we get rules for the core-classes as well – but can they stand up? Do they maintain balance? Let’s take a look! Summoning creatures is a standard action and they take their action immediately after the summoner in the initiative order. Summoned creatures fight until the end of the battle or until reduced to 0 hp – if they are defeated, you take psychic damage equal to the creature’s level. Creatures may be dismissed as a quick action. Unlike druid and summoner, the summoning options presented herein do not limit the character to one in effect at a given time – they do require the actions of the summoner to be fully effective, though. Integration of these rules is made more streamlined by a rather interesting idea: There are three types of summons -ordinary, superior and independent. Druids and necromancers summon superior creatures that have the regular array of actions. Conversely, clerics and wizards using these rules summon ordinary creatures, unless otherwise noted. Ordinary summoned creatures only take a standard, move and quick action if a summoner used a standard action to control the creature on his/her own turn. If not controlled thus, you roll a d6 to determine the default action the creature takes, varying from creature to creature. Lesser summoned creatures thus can take a full turn when controlled directly – but when more are available, you have to decide which one to control. An exception to this would be the option to summon mook swarms – the whole mob is considered to be one creature for the purpose of being controlled. Summoned creatures also are not quite as real as the…well…real deal. As such, they lack some of the better tricks the “proper” creature could pull off and most commonly is represented by less hit points. Summoned creatures may use the escalation die, but can change its value only during the turn they are summoned – this rule rewards PCs not immediately spamming creature upon creature on the battle field. Summoned creatures also count as allies – which means that they may soak up random recoveries and the like – another reason not to have too many of them around all the time. Summoned creatures also get no recoveries and heal only your level when subject to a healing spell based on recoveries and no, they do not get nastier specials. Personally, I am not a fan of the sloppy way in which the creatures are codified as spell or creature: Basically, the pdf says that they behave as spells when being cast, thereafter as creatures…unless the GM rules otherwise. More precise guidance would have been called for here. an epic feat? No? Very well then:” – I kid you not, that’s what’s written here. I don’t get why the designers of 13th Age insist on such unprofessional conduct. Not often, but here it is again – it’s probably intended to be funny, but it comes across as arrogant and belittling. Thankfully, the other summons do not feature such a line. On the plus-side, I do like how certain feats reward having certain domains…though the relative scarcity of spells herein means that only some domains are covered. As for demons, we get the imp (lvl 3 and 5), frenzy demon (lvl 5 and 7) and aforementioned laughing demon (lvl 7 and 9) as summoned creatures…and the laughing demon as a non-summoned, standard creature – and their nastier special is joker-gas-level brutal. Psychic damage whenever you save. Including death saves. Yeah. Ouch. Editing and formatting are very good – however, I do not understand the strange decision to clutter text together to the point, where one statblock and the text of another chapter almost visually blend together – that’s just odd. The pdf comes with nice full-color artworks and layout adheres to 13th Age’s 2-column full-color standard. The pdf has no bookmarks, when it’s one of the longer installments in the series and one more likely to see a lot of use – I don’t get why they’re absent from this installment. Rob Heinsoo knows his system and it shows – mechanically, there is quite literally nothing to complain about here – the rules provided are concise and playtesting did show them to be pretty balanced – no necro or druid will complain about them stealing their thunder and the unreliable demon summoning in particular can be considered to be pretty awesome. At the same time, this feels like a band-aid pdf…for a bullet wound in the system. Summoning creatures pretty much is a staple of fantastic gaming and this pdf does manage to introduce this component into 13th Age for two classes that ought to have had it in the first place. Still, that’s good. For two classes. If you’re a sorceror, chaos mage or the occultist wishing to dabble into summoning – tough luck, you get nothing; No special rules, no unique tricks – nothing. That’s one gripe I have against this pdf. My second gripe would be that non-combat summoning, utility-summoning, if you will, isn’t covered well here – and the scope even within the classes and in combat, is too limited. Want fire elemental summons? Design them yourself. Basically, we have the topic for a big book here, condensed down to its very basics. Sure, what’s here is solid – but the sheer amount of what isn’t here feels downright jarring. Relationship-effects on summons? Nope. Not even PCs in league with the Diabolist get some special tricks. Gold Wyrm/Priestess clerics and archons? Nope, no synergy. The domain-component is solid, sure, but the only thing this pdf accomplished in my group was to incite grumbling about the rules not supporting the character-concept my players wanted. What remains, what’s here, is a solid pdf that manages to avoid balance-issues and the spam-syndrome associated with summoning in other systems. 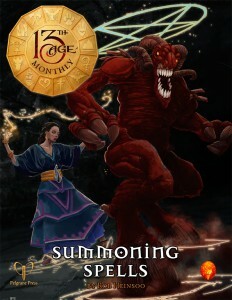 But also a pdf that leaves a lot to be desired, a long shot from a comprehensive array of summoning magic in 13th Age. My final verdict will clock in at 2.5 stars, rounded up to 3 for the purpose of this platform. 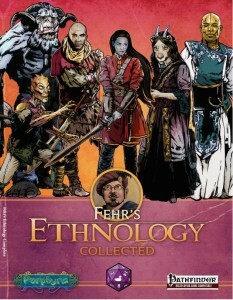 This massive compilation of Purple Duck Games’ “Fehr’s Ethnology”-series clocks in at an impressive 130 pages, 1 page editorial/ToC, 3 pages of SRD, leaving us with a massive 126 pages of content, so let’s take a look! We begin with a brief introduction of the subject matter and how to use this book before delving into the races themselves. Each of the write ups not only comes with the basic information on the race’s stats, but also extends to new race traits, alternate racial traits and favored class options. Beyond that, we get mundane and magical equipment for the respective races as well as unique racial archetypes, spells and feats – all of these help particularly in making the unique races fit within Purple Duck Games’ unique patchwork planet Porphyra. The inclusion of age, height and weight-tables for the races featured is also rather appreciated. The first race covered would be the Avoodim. Essentially, they are a melancholic race cast down from heaven – having failed at becoming archons, they in their shame didn’t try again and hence have been sent down to earth, looking for a way, a purpose, a chance for redemption. Avoodim get +4 Con, +2 Str,-2 Dex and Cha, are native outsiders, get darkvision, celestial resistances, +2 to craft or profession-checks related to stone/metal, and +1 to atk against all outsiders, the option to use doom on foes as well as a racial susceptibility to bouts of melancholia and despair. The increased potency over the previous iteration of the race is justified via a 1/day forced reroll on a natural 20, as creation itself seeks to keep them low. (And yes, there is a feat, which, while lacking the “Benefits”-header, lets you mitigate this – and yes, the feat is more solid than in the previous pdf. While an uncommon mechanic and while I’m not a fan of the martial bent of the race (preferring races to have both bonuses for physical and mental attributes), this balancing mechanism can be nasty…and pretty unique. It also should show you something rather significant: Unlike many compilations out there, this is not simply the sum of its parts – it has been tinkered with, retooled and changed. While not all components like traits are 100% precise in their wording à la “You may cast virtue as a spell-like ability 1/day, only on yourself.”, one can glean the intent of the range being modified to personal from this still -not perfect, but it’s functional. Similar hiccups à la “sightline” for “line of sight” and the like continue to crop up throughout the book and while they are neither glaring, nor crippling, if you’re a stickler for rules-language, you may feel a certain twitch when reading such components. At the same time, e.g. getting temporary assistance of avoodim NPCs at level-2 once per month can be pretty cool. It should be noted at the same time, that the aforementioned hiccups in rules-language are not a constant throughout this book, mind you: Some of the new archetypes/class options provided, like the anti-mook fighter “One-Man-Army” get highly uncommon, yet interesting abilities, the signature of which lends you +1 attack at your lowest BAB when attacked by more than one creature. While this looks like it can be kitten’d, that’s not the case – the requirement for even attack dispersals between valid targets prevents any cheesing of the ability – NICE. The quadribrachial dhosari are an interesting race – flavor-wise, bred as slaves for the Erkunae, these uncommon beings not only have 4 arms they can bring to bear – their additional archetypes and material are also interesting; alas, at the same time, the race has still inherited some of the issues from the individual installment first detailing them. The pdf still does not specify, for example, whether they can wear two sets of bracers, 4 rings, etc. and I still consider their abuse-potential quite frankly too high. The same can thankfully not be said about two of my favorite races from the original series, namely the dragonblooded and the erkunae – both races are pretty well-balanced and yes, inspired even. To the point where I allow both in my own games, though, again, the rules-language is not always perfect in either cases. The yeti-like Ith’n Ya’roo have btw. also been cleaned up: The broken feat-granting trait is gone and instead, bleed damage via bone weapons becomes feasible and the prior first level immunity to cold has been properly nerfed to a significant, but feasible immunity. Granted, the racial trait “Resistance to Cold Adaptation” should probably just read “Cold Adaptation,” but at least the ability works. This level of fixing and expansion btw. also extends to the formerly pretty ridiculously-named Hhundi (which sounded like the German equivalent of “doggie”) being renamed Kripar: Gone is the broken “roll twice” trait that constituted the race’s most grievous glitch: Instead, we get a nice race of solitary lurkers and ambush predators – and yes, now we get a proper age, height and weight table. The psionic, mute cat-people Qit’ar still can be considered nice and e.g. a solid psychic warrior path among the new features makes sure that I am not going to revise my rather positive stance on the race – I like them. My favorite plant-race out there by now, the wonderfully weird Xesa (and perhaps the one race where I swallowed my disdain for +4 attribute-races) also are further expanded…including a psion-archetype that allows for the limited and controlled burning of Con to gain power points, which is pretty nice. The fact that they also gain +1 power per level as long as psion is their favored class, though, is too much. I’d cut that down to at least +1/2. Still, a compelling write-up. The most problematic race among the original series was the Urisk-race and while, balance-wise, I am still weary of it and consider the thematically-awesome fey-hillbillies too strong for my tastes, I should note that e.g. the highly problematic Dance of the Fey-feat has since been cleaned up and now has a precise, functional wording – so yes, such changes overall make the race better than it was before. The book also sports new material regarding whole races, btw. : Take the Eventual:+2 to Con and Int, -2 Cha native outsiders with darkvision, electricity resistance 5, 1/day shocking grasp, at-will tongues and law affinity for sorc-spells and abilities render this law-centric variant of the outsider-blooded theme pretty solid regarding the foundation, something that thankfully generally extends to the traits and alternate racial traits. The racial feats allow you to further build on the inevitable-flavored heritage of the race. Indeed, e.g. a counterspell specialist-feat can be taken as example for what I love and hate about this book: The feat per se is solid in its intent, but we have a wording like this right in the middle: “Your Spellcraft check you must succeed at to identify an opponent’s spell is equal to 20 plus your opponent’s spell level, but you are able to cast as your counterspell any spell from the same school as the foes.” That’s the middle of the three sentences and yes, I pasted it straight from the book…and yes, it hurts me to have to complain about hiccups like this, particularly among concepts I enjoy. One spell that allows for a limited time-reversal is somewhat problematic and should be controlled rigidly by GMs, but it may also be truly outstanding for some groups. The saberhagen lawful barbarians with their rigid rage codes may be locked into a progression according to the code chosen among the 3 available, but they are interesting enough. All in all, a solid racial addition. The second newcomer herein would be the Polkan, who is a somewhat centaur-like race that gets +2 Str and Wis, counts as monstrous humanoids, is large (but wields medium-sized armor + weapons), can see twice as far in starlight/dim light (low-light vision by any other name – why not use the proper name? ), a base speed of 40 ft, +4 quadruped bonus vs. trip and limited retries on failed Diplomacy-checks. Generally, I like the race and its racial options – the feats, hoof-spikes and similar supplemental contents provided are nice; alas, much like all centaur-like race takes I’ve seen so far, the race fails to provide the proper information regarding the magic item slots it should have and neither does the race fix the old ladder-conundrum. Now, I like to end reviews on a high note and the xenophobic, elemental-worshiping Zendiqi definitely are just that. Being one of the few races that have managed to secure a permanent place among those in my campaign – something precious few races managed to achieve, mind you, the Zendiqi are simply inspired and work well in just about any campaign – from Sword and Sorcery to high fantasy. The introduction of e.g. an archetype of the hero-point-based infinyte-class is more than welcome here: The archetype takes the narratively intriguing fluff of the base-class and expands it by a flavorful concept, introducing a kind of antibalance, a champion of change by virtue of order or chaos. Speaking of high notes: The extensive rules-index in the back of the book helps keeping tabs on all the options contained herein. Editing and formatting, on a formal level, are pretty good. Layout adheres to Purple Duck Games’ slightly streamlined, printer-friendly two-column standard, with quite a few nice full-color artworks and the pdf comes fully bookmarked for our convenience. First things first: This is the type of compilation pdf for which I do not mind re-reading the whole material – this is due to two facts: 1) Perry Fehr’s fluff is excellent. While the main author of this book imho is much better with fluff than with crunch, one can see both his and Mark Gedak’s talent in the expertly-written, high-concept fluff provided herein. 2) The compilation here actually took the vast majority of the more grievous issues and balance-concerns and cleaned them up, something also by far not all compilations do. And then, there would be the SIGNIFICANT array of new material provided in this book, which I btw. only cursorily touched upon in this review. Indeed, if this compilation did one thing right, it would be that it further expanded upon the strengths of the material herein and were I to rate concepts alone, this would be my favorite racial pdf in a long time. At the same time, however, and there is no denying that, the rules-language, while functional for the most part, is simply imprecise. I’d indeed harp on it much more, were it not for the fact that, time and again, the book gets it right..and then restarts the glitchy parts. It’s odd and somewhat frustrating, at least from a reviewer’s perspective. There is a lot of non-standard wording in these pages and if you’re like me, that may make you cringe a bit. The book, alas, also suffers from a few questions not answered regarding e.g. minor balance-concerns with some of the races herein. The question thus is valid – to get this or not to get this? I am quite frankly hesitant to pronounce an all-out recommendation for this book, considering the hiccups contained herein – they are somewhat glaring and, at least to me, tarnish the otherwise inspired content herein. Undoubtedly, though, few books on the topic of races have managed to inspire me to the extent that this book has and fewer still had their featured races enter my game to the extent this book has. GMs confident in their abilities to iron out the rough spots and capable in determining whether a given race is for their game should definitely take a look – for the low price, this indeed is a good haul of not always perfect, but always inspiring, content that is bound to inspire with its prose, content and cool races. My final verdict will hence clock in at 3.5 stars, rounded up to 4 since this book does not deserve being relegated to the middle grounds. You can get this flavorful collection of uncommon races here on OBS and here on d20pfsrd.com’s shop!